Graphics One is pleased to announce the first eco-solvent printer which can be upgraded to an integrated print and cut system. 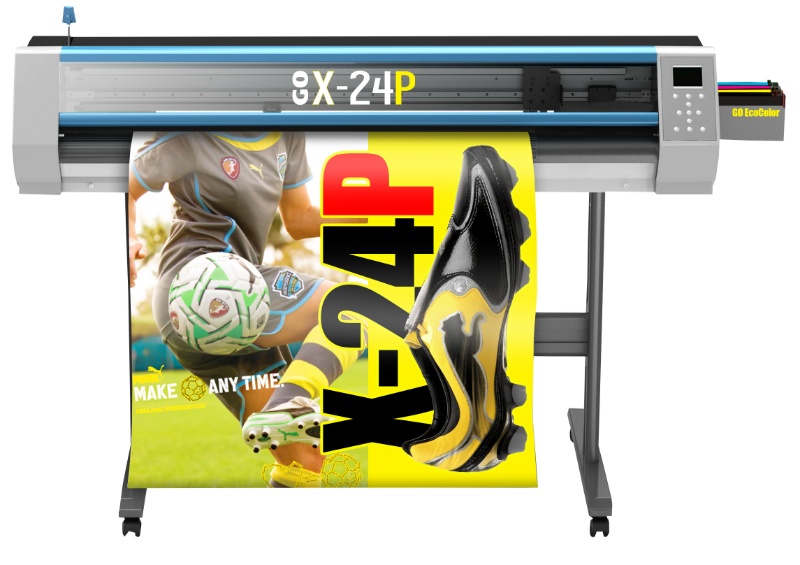 The GO X-24P (P model) is a 24-inch eco-solvent printer targeted at garment decorators, display makers and those looking to produce cost effective decals. Following on the successful launch of the GO X-24PC (with integrated cutter), the printer only version offers the same capabilities, but without the cutting option. GO’s X-24P is a 4 color printer offering imaging up to 1440 dpi with DX5 printhead technology and comes complete with the stand, ink and RIP. The GO EcoColor eco-solvent ink produces durable images for both indoor and outdoor applications and is perfect for the targeted applications. Priced at $7,195, the GO X-24P printer package includes the printer, a heavy duty printer stand, four 220 ml cassettes of GO EcoColor Ink and FlexiSign RIP. The contour cutting upgrade is only $800 for a GO X-24 system for a total of $7,995. Additionally, GO’s EcoColor eco-solvent ink is priced at $45 per 220 ml cassette and is manufactured in the U.S. The GO X-24 printer will begin shipping in late July.